From the bestselling author of Getting Organized and The Organized Executive, a powerfully enlightening yet practical audio program for restructuring your life to meet the conflicting demands on your time and energy. Do you ever feel that there simply aren't enough hours in the day? Are you worried that your schedule gives your children short shrift? Has your career fallen short of where you had hoped it would be by now? Is your schedule too tight to exercise as often as you would like? Are you frequently late for appointments or meetings? Does the pace of life sometimes feel downright overwhelming? If you've answered yes to some or all of these questions, it may be time to make adjustments, or even some major changes, to your life. 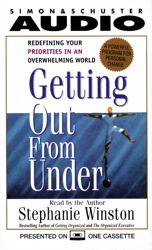 From daily work and home-related tasks to the larger, long-range concerns of career and family ambitions, Getting Out From Under will help you break vague discontents into manageable problems and offers concrete solutions to ease the pressures of an overwhelming world. Listen to this audiobook and start getting out from under!